I went for a new cover all – thoughts? 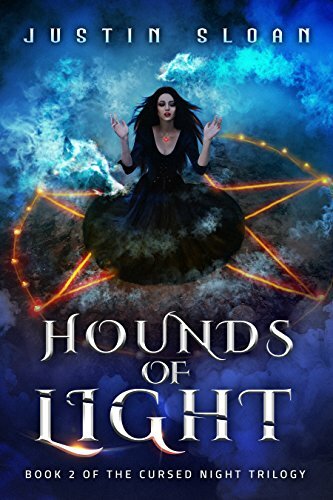 This is for Hounds of Light, book 2 in the Cursed Night series, a spinoff of sorts from the Bringer of Light trilogy (all loosely connected in the Eternal Light saga, in case you didn’t know). Since this book focuses more on the magic, I thought this more appropriate. And Christian (of Covers by Christian) did an amazing job. Thanks, Christian! Katherine is all that stands against a secret order of vampires and an army of werewolves. The werewolf army’s power has spread far and wide, and a new enemy arrives using dark magic. 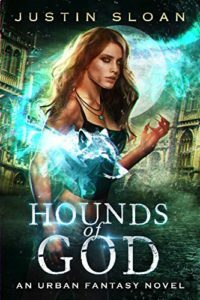 Katherine has no choice but to rely on her new half-vampire friend to uncover the new enemy’s hideout and stop him and the other vampires from seeking control over all remaining werewolves. It’s a battle of epic proportions, but Katherine finds new allies on the side of light and honor. Will her new friends come through for her when she needs them? 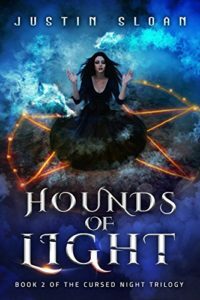 Can Katherine stand up to a new order of werewolves and their would-be enslavers? Unfortunately for her enemies, she refuses to surrender, and her friends got her back. There’s no middle ground here, simply victory and world-peace, or utter destruction. And don’t forget that the book 1 audiobook is now available! FREE with a trial at Audible.com (HERE).